Apple today released a new software update for the Apple Watch, upgrading watchOS 3.2 to watchOS 3.2.2. The watchOS 3.2.2 update comes more than one month after the release of watchOS 3.2, an update that introduced Theater Mode. watchOS 3.2.2 can be downloaded through the dedicated Apple Watch app on the iPhone by going to General -> Software Update. To install the update, the Apple Watch must have 50 percent battery, it must be placed on the charger, and it must be in range of the iPhone. An iPhone running iOS 10 or later is required to download the new software, but it is available for all Apple Watch models. 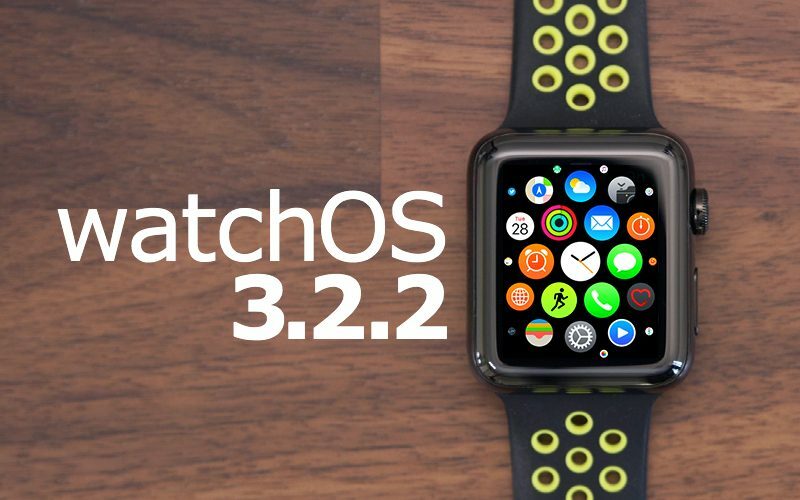 During the beta testing period for watchOS 3.2.2, no major changes or feature tweaks were discovered, so watchOS 3.2.2 appears to focus mainly on performance improvements and bug fixes. watchOS 3 will soon be succeeded by a new version of watchOS, which we expect to see introduced at the June Worldwide Developers Conference. Can we please do away with the requirement to have the watch on the charger? If I have more than 50% battery, why does it have to be on the charger? The Watch seems more susceptible to bricking if the update gets interrupted-- I'm guessing they're making damn sure the watch doesn't lose power during the process. Hi. I guess you have a New XC90,V90, or S90. If so the problem with the remote start is not your apple devuces but is a problem with the cars software. There has been a Volvo software upgrade for this a few weeks now. There is also a new complete Volvo software upgrade that changes the touch screen tia much better design. Make sure your car has half a tank and is connected to the pump before attempting the update. Will it finally fix my Volvo app being unable to start my car since changing watches or upgrading to a newer model? Something is wrong with the way the digital signature works (according to Volvo) when you change devices. You're still not following what I am saying. The charger automatically reboots the watch. Maybe the installation process doesn't have the reboot automatic like iOS, so the only way is to be connected to the charger. I'm trying to think outside the box to make a logical explanation of why the charger is required. And this completely satisfies that. Your thinking is wrong. The requirement is only for it to be on the charger when the process is initiated. Once it starts you can wear your watch and installation continues, including reboots. I don't believe that is correct. Removing the watch during the install process can lead to bricking the device. My friend's watch was updating then the power went out. Got the red exclamation point. Had to shipped off to Apple. "Can", but not "will". I have, on multiple occasions(watchOS 1 to 3, Apple Watch Series 0 and 2), initiated an Apple Watch update by putting it on the charger, then taking it off once the upgrade process indicator circle appeared. I have always finished the updates with no problems whatsoever, as long as my iPhone was near the watch. I've even done this while traveling and getting Wi-Fi connection only at the beginning of the update process. I Don't believe this is accurate. I don't have evidence and nor have I tried this, but the Apple Watch needs to be connected to the charger during the entire update process. I will Contact Apple on this tomorrow and ask, now that my curiosity is piqued. As pointed out above, the hypothesis that the charger is required for entirety of the update process is invalid. This also invalidates the hypothesis that the charger is required for the reboot of the Apple Watch during the update process. Once the initial update conditions are met (Wi-Fi, 50% charge, on charger) and the update starts, you can move away from those conditions and still finish the update just fine, as I and ErikGrim have done. Based on these observations, I hypothesize that the conditions were mandated in order to reduce, as much as possible, the possible fail states that lead to bricking, not that they are absolute necessities. I must say that after this update I have noticed that the battery life is greatly improved over the short time its been installed and used. WOW! This update added steroids to my battery! I had a very good battery life previously but after this update, on a regular usage of my watch, I woke up this morning at 6:30 a.m. and until 3:30 p.m. the battery dropped form 100% to 94% only! In the past I had about 14-15% down in this time range. It's not placebo, I wasn't even expecting improved battery life. So after 13h and 10 minutes my battery is at 86%!!!! I even had to talk over the phone through my watch for a couple of minutes. 6 hours after putting my Series 2 on this morning, it is still at 100%! That can't be right!!!?? Yep.. this is 100% correct. Once the installation process has started, you can remove the watch from the charger. I just did it this morning. Once the download to the watch is completed and the installation starts, you can safely remove the watch from the charger. The charger is required because the watch can't perform the update if the internal temperature of the watch is below a certain point. Connecting the charger causes the temperature to rise and thus allows the update. Yes, I know that's stupid. I'm sorry but thats ridiculous, at least my hypothesis is plausible. When you install an update, in between the two Apple logo cycles, you will hear a chime of it connecting to the power supply. That means the watch is being woken up by the power supply. That alone is enough to support my hypothesis as being plausible. So to compare something that might be accurate, to something outrageous as raising the temperature is just wrong. I don't see you trying to come up with a hypothesis of why the charger is needed, instead you are here just putting down mine. (1) I'm sorry but thats ridiculous, at least my hypothesis is plausible. (2) When you install an update, in between the two Apple logo cycles, you will hear a chime of it connecting to the power supply. That means the watch is being woken up by the power supply. That alone is enough to support my hypothesis as being plausible. So to compare something that might be accurate, to something outrageous as raising the temperature is just wrong. (3) I don't see you trying to come up with a hypothesis of why the charger is needed, instead you are here just putting down mine. (1) Yes, it's completely ridiculous. My point was that throwing around unsubstantiated and untestable hypotheses can be done by anyone and isn't particularly interesting. (2) Yes, in the same manner that the sound of a cow bell around the corner means there is a cattle herder herding cattle around the corner. It's not impossible, but you can't conclude one from the other. The appearing of the charging sound does not allow one to conclude anything at all except that power is connected. (3) I did. That it's required because of a software limitation. Or in other words, that it isn't really required. Could still be considered a "huge leap with no supporting evidence" as you phrase it. Exactly what you are accusing the other poster of. At least if you're gonna shoot down someones else hypothesis come up with some verifiable facts. Otherwise what's the point, you're in the same trap. - What can be hypothesised without verifiable facts can be dismissed without verifiable facts. - And that's the end of that. Thanks to wesley96 and ErikGrim for sharing their experiences. It is just a software limitation that Apple could lift if they wanted to.